This weekend I've made a few modifications so the quad bike will hopefully pass the approval test without any problems soon. The brake system is completely original again. The footbrake brakes on all of the wheels now. 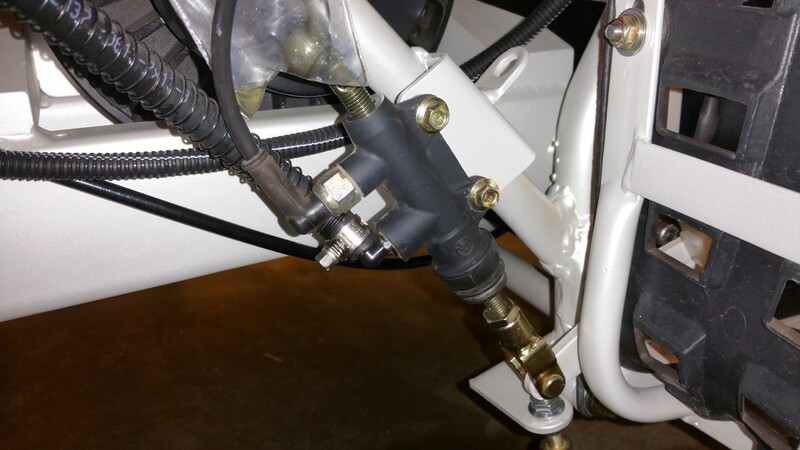 Both brake lines are connected to the brake cylinder now. The mechanical handbrake is back on it as well. 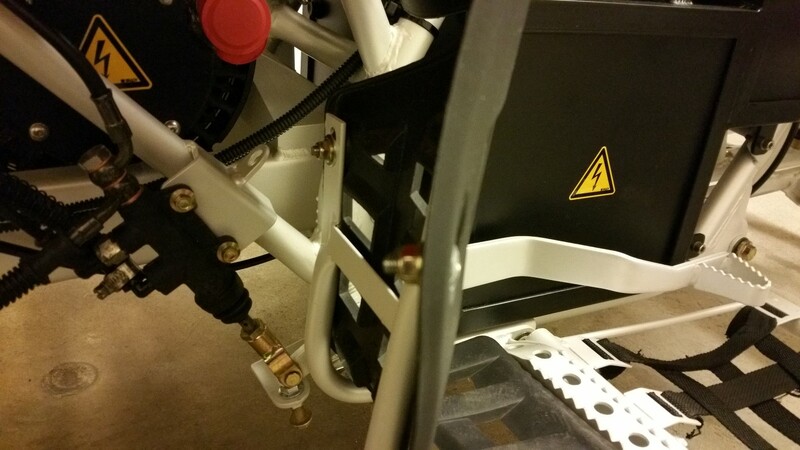 I've also made a system that gives a warning signal when you get off the quad bike while the drivetrain is still active. I've done this with a switch in the left foot peg. The drive mode buttons will all 3 flash when you get off. Since the flash relay I'm using doesn't work well with only LED's I wanted to hide a normal light bulb somewhere which also flashes together with the LED's. 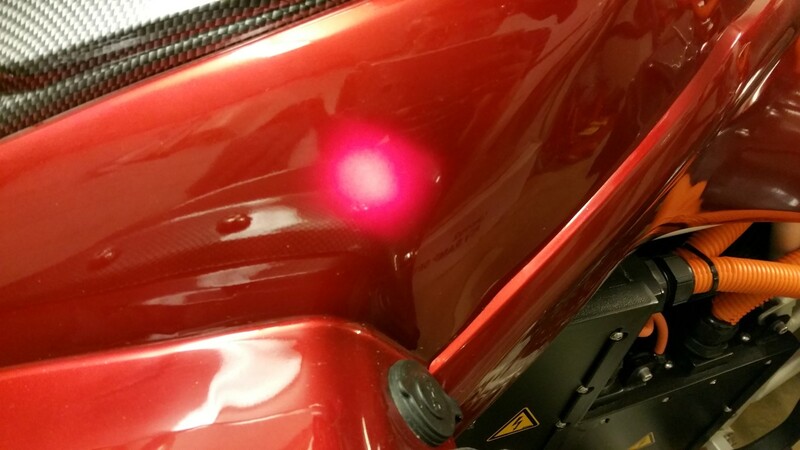 But it turned out I couldn't hide this, the light just shines right through the plastic fender. I actually like the effect it gives and it makes it even more clear that the drivetrain is still active. Since I modified the brake system I wanted to test again. Because it was necessary ofcourse, not because I just wanted to or something like that. :) But in any case the brakes seem to be working just fine. Everything that had to be modified for the approval has been done now. There are still a few things where I'm waiting on a reply from the RDW. But hopefully I'll hear something about that this coming week. I'm also looking to make a new appointment already for the approval test. I left early again this morning to go to the RDW for the identity check. Didn't have to drive as long this time, for this check I could just go to the nearest inspection centre. Had to be there at 8 o'clock and I was even first in line. 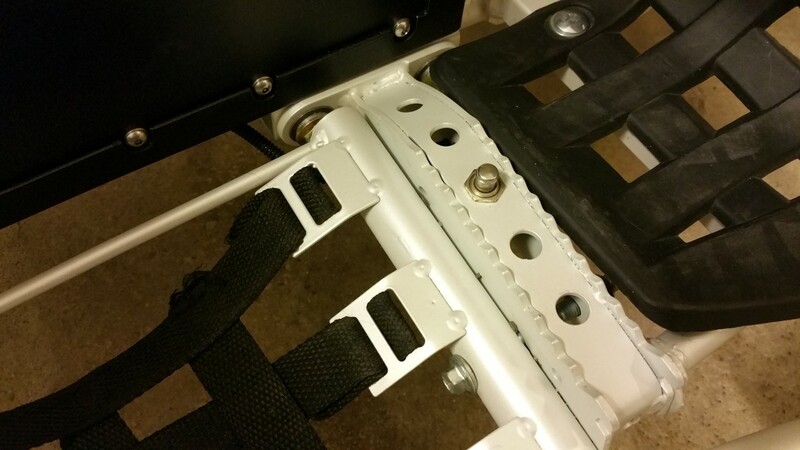 The spot of the chassis number was inspected and also all of the documents and pictures I took with me. After all this I came home from the RDW again with a good feeling. Just still have to modify a few things now and then I can go back for the approval test. Hopefully it won't take as long this time till I can go there. 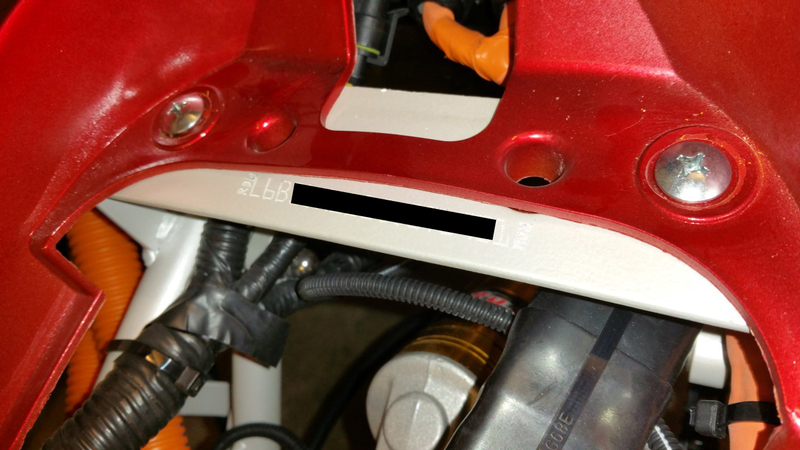 Just a quick update before I go to the RDW tomorrow for the identity check of the frame. Since the approval test I didn't really do much anymore. I did already start making a system that gives a warning signal when you get off the quad bike and it's still in drive mode. 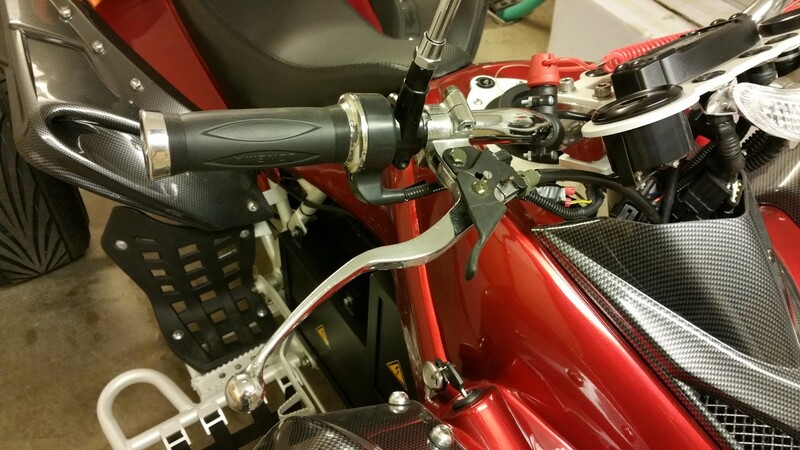 I placed a switch in the left foot peg, looked like the best place to me. 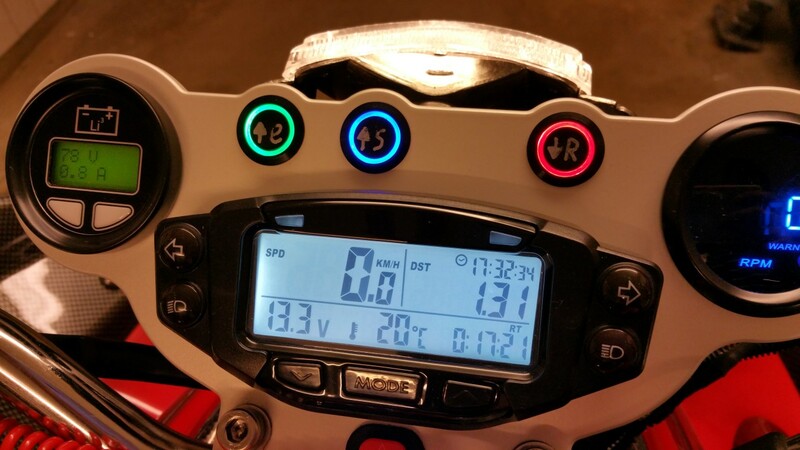 With a flash relay I'll just let all of the LED's of the drive mode buttons flash. Should be good enough. But it's still not quite working, need a few more small parts for this. For the rest I've been busy making the brake system original again since last friday. 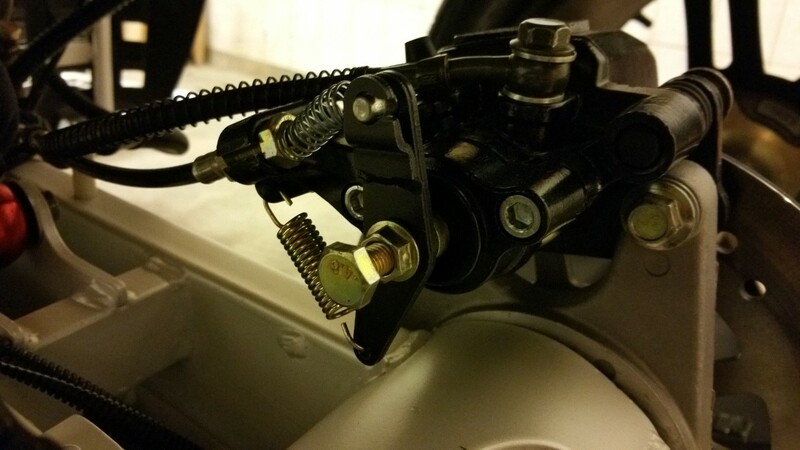 I had the handbrake attached and also all of the brake lines connected to the brake cylinder of the footbrake. I just couldn't get any brake pressure anymore after that. I've tried everything to bleed the brake system but no luck. So I inspected the brake cylinder but couldn't really notice anything strange. It could be that the rubbers are just worn out a bit since I still remember when I bleeded the brake system the first time about 2 years ago black brake fluid came out of it. Already thought that was odd but it did still work just fine. Few months ago I bleeded the brake system again and already had a lot less brake pressure, now nothing at all anymore. 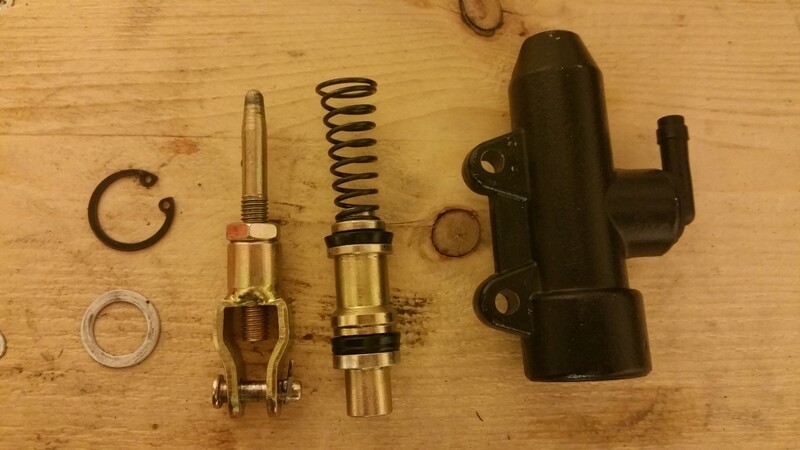 So I quickly had to buy a new brake cylinder and chose for a better one right away. A Brembo that has once been on a KTM motorcycle. This one works perfectly, bleeding was quite easy again. I just still have the brake system seperated since I don't have a double banjo bolt with the right thread size, will look into this after the identity check of the frame. More important right now is that the brakes are working well again. For tomorrow I'll just have to wait and see. Hope it'll all go well so I can quickly go back for the approval test again. I'll let you all know how it went tomorrow. 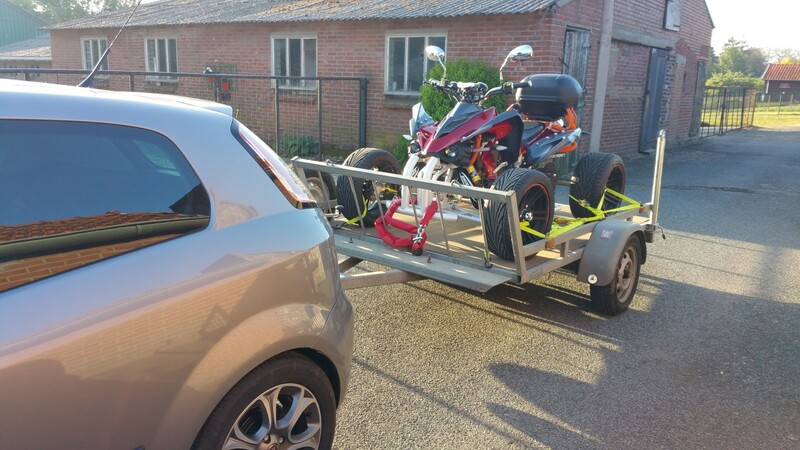 Yesterday I woke up very early to place the quad bike on the trailer so I could go to the RDW. It was a very long trip and I arrived there safely and on time. Was just a bit too early, no one was there yet so I had to wait at the main entrance for a bit. It was all still very exciting, but then they started with the test. 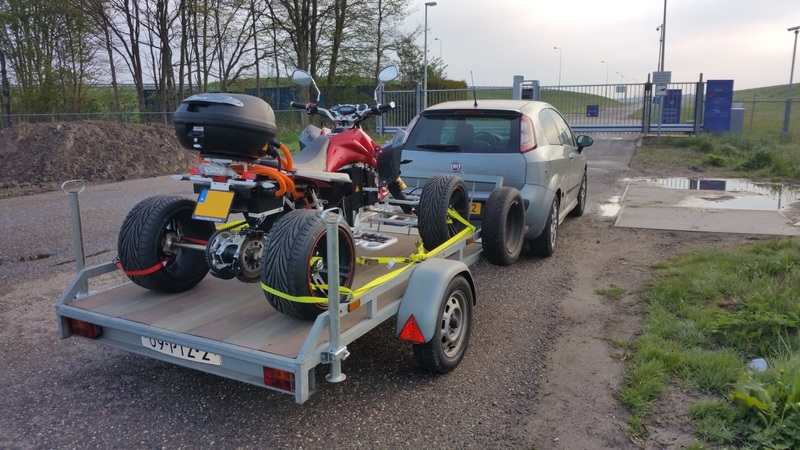 Unfortunately it quickly turned out that it would fail the test because the chassis number wasn't clear enough after sandblasting and spraying of the frame. You can still see it but it's hard to read it by just looking at it. According to them the chassis numbers are never really affixed deep enough with Chinese vehicles. It's a shame really but it is what it is. I will now get an identity check on the frame where they'll see if the frame is still the original one. I'm just going to assume that this will all go well and then the chassis number will just get affixed again. 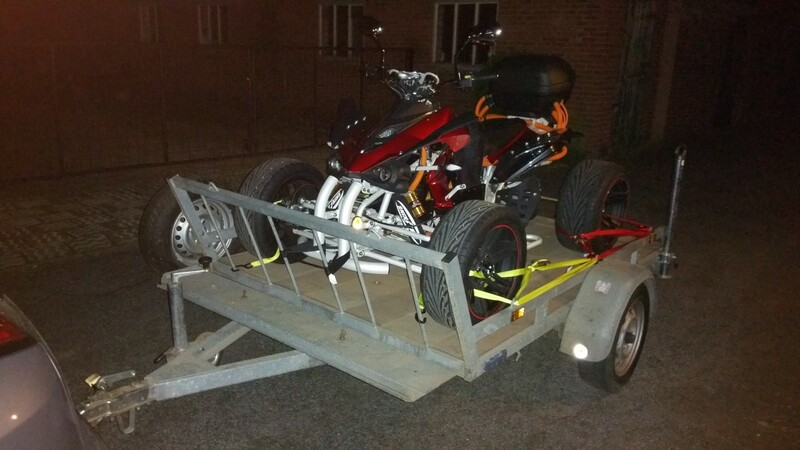 But even if the chassis number was all good the quad bike probably still wouldn't have passed the test. At the beginning of this project I already seperated the brake system so I could operate the front and rear brake independently. Much safer this way, just like on a motorcycle. I also removed the hand brake since this wasn't working, I had this hydraulic after seperating the brakes so there's still a hand brake present. But that's apparently not allowed, the brake system has to stay original, even if it's actually worse then. So I'll have to change this back again before going back for another test. They also checked a few other things and I'll have to modify some small things. But that all isn't much work, the main things are definately the chassis number and the brakes. That was it for the less fun things of the approval. What actually was fun is that they weighed the quad bike. The total weight turned out to be 271 kg (597 lbs). Way more than I expected, thought it would be around 240 kg (529 lbs) somewhere. But it's still below the maximum allowed weight. It's just that the amount of seats will be adjusted from 2 to 1 on paper. Have no issues with this since no one fits on the back anyway. But they actually weigh the weight seperately on the front and rear axle. This was very interesting since I was really curious about the weight balance. And what do you know, the weight balance is a perfect 50/50. 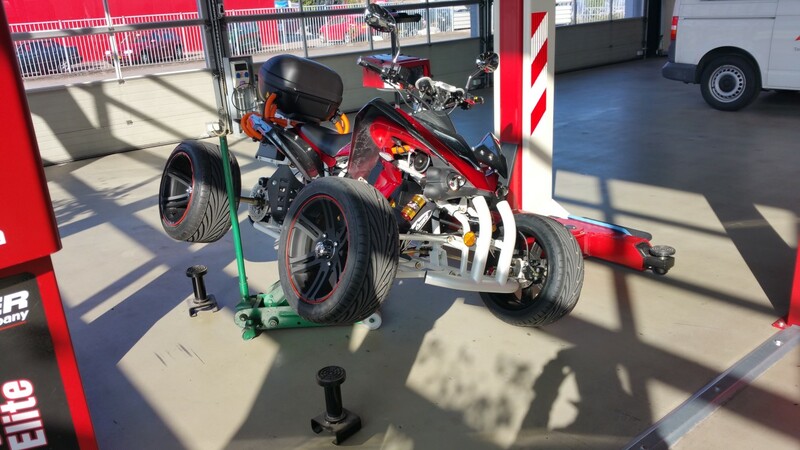 On both the front and rear axle they weighed 135,5 kg (298,5 lbs). This was a nice surprise, I didn't even try to get the weight balance this good. But that's about it for the approval. Have to wait and see now when I can go for the frame. This might just take a few weeks. For the rest there are still some problems with EMC (electromagnetic compatibility / noise) and it's definately possible that I need to get a seperate EMC test done which will cost around 1500 euros. Not really looking forward to that either but I still don't know everything about this. Will probably know more about this next week.